This one was delicious, but unfortunately the photo series is marked incomplete. Jessica and Mike came over, as did the Thrifty Sifter, and eventually upstairs neighbour Michael, everyone got to talking, and I forgot to take pictures. Hey, I can talk with the best of them! Still, these did come out extremely well, pan fried in the skillet until the bacon was brown, then baked in the oven at 400 degrees for 20 minutes. I sliced the chicken crosswise for the plates and had trouble not drooling into the food. Served with black quinoa mixed with a dollop of bacon fat and a fantastic romaine salad, this meal was a winner. I already went over the cooking above. To prepare the breasts first season with the salt and pepper. Next cut off the tender (the strip of meat along the side that attaches to the rib cage). 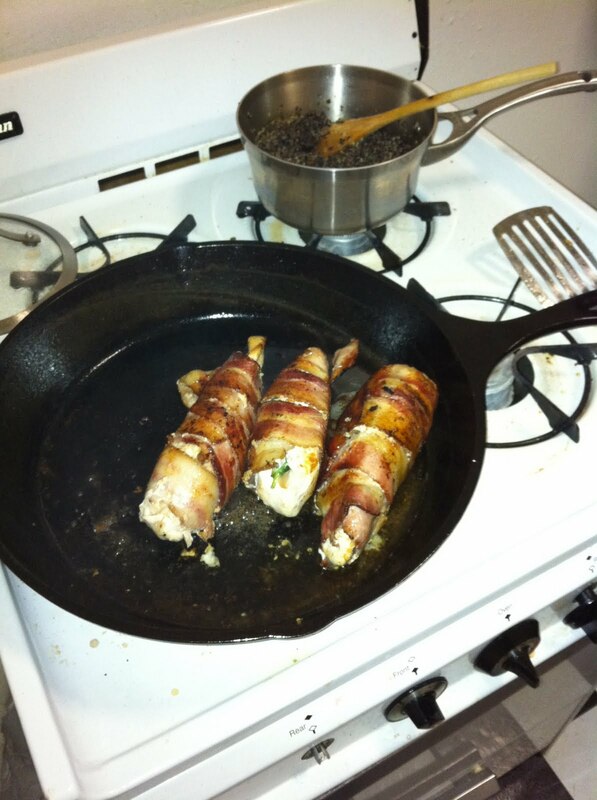 Wrap the tender in basil leaves (5 - 7). Some breasts are large enough that you wouldn't need to butterfly them to accomplish the stuffing, but not most of the ones in my local grocery. 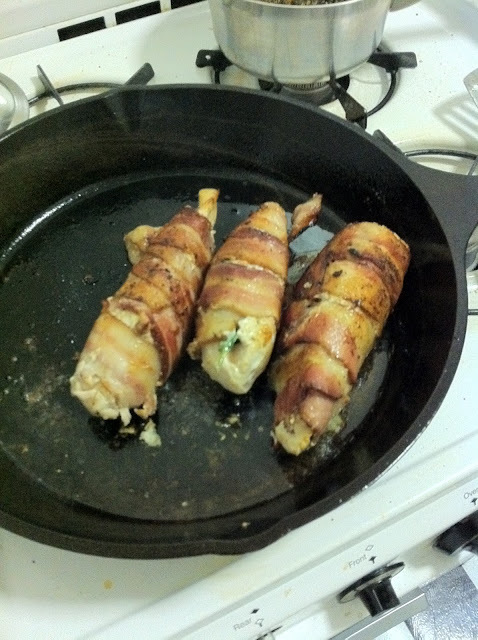 Once you have the tenders wrapped, place them in the center of the butterflied breast, then wrap the breast in 3 - 4 slices of bacon, taking care to tuck in your loose ends. Spiral patterns help here, but we'll also accept Möbius strips. You're all set to cook and enjoy! Your soundtrack for this entry: Van Halen - Jamie's Cryin.